Jesus gave "keys" of the kingdom./kindom "to Peter and to community as a whole"
In Matthew 16:18-19 and Matthew 18: 18, Jesus gave the "keys" to the Kingdom/Kindom of God to Peter and to the community. Gary Wills, Pultizer prize winning author, sums up the scholarship: " But Jesus, in the same gospel, gives the same power not to Peter exclusively but to the followers as a body: 'In truth I tell you (hymin, plural) that whatever you tie on earth will have been tied in heaven, and whatever you loose on earth will have been loosed in heaven "( Mt. 18:18). "From this Augustine concluded that Peter is just ' a representative of the church'- and in fact the community as a whole had the power to include or exclude members in the early gatherings." Gary Wills, What Jesus Meant, pp. 80-81.
emphasized -- so the church was built on the faith of believing Christians. any law, at any time, at any moment. many in the church today, that we need to change." --Bishop Tom Gumbleton This homily was given at St. Hilary Parish, Detroit, Mich.
"...maybe God is calling us to a profound change and that is something that I think about this week because just a few days ago, -- a week ago now -- there was another ordination of a woman to the priesthood that happened in Lexington, Kentucky. "Maybe if we think about this, pray over this, and maybe within our church if we really entered into dialogue with women and come to experience how they experience "I'm being called by God" just as honestly and with as much prayerfulness as any man who was ever called to the priesthood. Maybe if we listen to them, look at their faith, the love that they have for our church and for the ministry, maybe if we engaged in dialogue, we would see that yes, God has planted a seed where women have a role of leadership. " " ... Victoria Rue hopes her trip to Indonesia will plant a seed that eventually sees the> ordination of this country's first female priest... ""Women have been thought of as evil, sinful and lustful, as representing only the body and not the spirit."" Rue, who is also a lecturing professor of comparative religion and women's studies at California's San Jose University, said women have been systematically excluded from positions of power in the Church." 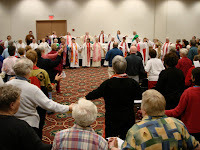 Let us be glad and rejoice that a new day has begun for dialogue for justice for women in the church. One of the major outcomes of the meeting between Fr. Roy Bourgeois and his Maryknoll Community is that there will be a continued dialogue on women's ordination in the Roman Catholic Church. This presents an opportunity for Roman Catholic Womenpriests to share their experience of a renewed priesthood with religious orders and our brother priests and bishops. May this endeavor lead us forward into the Gospel Equality, (the kindom) that Jesus modelled. It is our hope that our brother bishops and priests follow Fr. Roy's prophetic witness! When I met Janice Sevre-Duszynska years ago in the SOA Watch movement, she spoke about her journey of faith and her call to be ordained in the Catholic church. That day has arrived. And we are here to share in her joy and to support Janice in her call to the priesthood. As we know, the ordination of women in the Catholic church is a controversial issue. 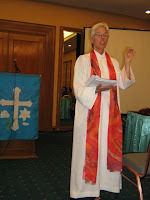 Ten years ago I wrote the following letter to my Maryknoll community about why women should be ordained. It was published in the Maryknoll newsletter under the headline "No One Likes a Bully." In prison one has a lot of time for long thoughts and long prayers. 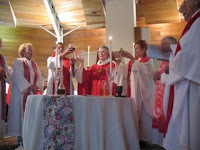 Among my thoughts has been the issue of the ordination of women in the Catholic church. Years ago, while in the military, I felt called to the priesthood and entered Maryknoll. Today I have women friends who say God is calling them to the priesthood. Who are we to judge their calling? As people of faith, we believe that a person's call to ministry is initiated by God and is something sacred. Who among us has the right to tamper with God's call? In my 26 years as a priest, it is my experience that we need the wisdom, sensitivity, experiences, compassion and courage of women in the priesthood if our church is to be healthy and complete. Sexism is a sin. However, [according to] the idea of Joan Chittister, the problem is not so much with sexism as it is with the perception of God held by those who oppose the ordination of women. As people of faith we profess that God is all powerful and the source of life. Yet, when it comes to women being ordained, it seems that opponents are saying that this same God who is all powerful and created the heavens and the earth and can bring the dead back to life, somehow, cannot empower a woman to be a priest. Suddenly, we as men believe God becomes powerless when women approach the altar to celebrate Mass. I am in prison for protesting the training of Latin American soldiers at the U.S. Army School of the Americas (SOA). The SOA is about men in Latin America who abuse their power in order to control the lives of others. They cause people to suffer and are seen as bullies. There are also bullies in prison who cause fear and threaten to punish those who speak out. Now I have been a Catholic priest for 36 years and I must say, more than ever before, I am convinced that women should be ordained in the Catholic church.The hierarchy will say, "It is the tradition of the church not to ordain women." I grew up in a small town in Louisiana and often heard, "It is the tradition of the South to have segregated schools." It was also "the tradition" in our Catholic church to have the Black members seated in the last five pews of the church. No matter how hard we may try to justify discrimination, in the end, it is always wrong and immoral. As Reverend Nancy Taylor of Boston put it, "Prejudice in liturgical clothing is still prejudice." We can go to the Scriptures and find numerous passages that support the ordination of women in the church. In Romans 16:7, we read that in the early church of Rome, a woman named Junias is described by Paul as "an apostle" who was imprisoned for spreading the faith. In Galatians 3:26-28, we read, "It is through faith that you are God's sons and daughters. . There is neither male nor female. In Christ Jesus you are all one." And in the Gospels we read that after Jesus was crucified, he chose to appear first to Mary Magdalene and other women. Jesus told the women to go and bring the news of resurrection to the men who, out of fear, were hiding behind locked doors. Janice has been very active in the SOA Watch movement. As a high school teacher, she participated in a nonviolent protest against the SOA and was sent to prison for three months. Janice and the more than 250 others in our movement who have gone to prison are called, "Prisoners of Conscience. "Conscience is something very sacred. It gives us a sense of right and wrong and urges us to do the right thing. Conscience is what compelled Franz Jagerstatter to refuse to enlist in Hitler's army. On this day, August 9, 1943, this humble farmer was executed for following his conscience. Conscience is what compelled Rosa Parks to say, "No, I cannot sit in the back of the bus anymore." Conscience is what compels Janice Sevre-Duszynska and the other women to say, "No, we cannot deny our call from God to the priesthood." And it is our conscience that compels us to be here today. How can we speak out against the injustice of our country's foreign policy in Latin America and Iraq if we are silent about the injustice of our church here at home? Janice, all of us present in this church today, and the many who cannot be here, support you and walk in solidarity with you in the struggle for peace, justice and equality. May our loving God bless you in your ministry and journey of faith.